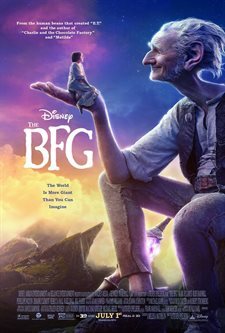 Download The BFG in Digital HD from the iTunes store. The BFG images are © Walt Disney Pictures. All Rights Reserved. Some would argue that author Roald Dahl was a deeply disturbed individual. Others would argue he was a brilliant writer. Some would say he was both. As the author of many children's and adult books, such as Charlie and the Chocolate Factory and James and the Giant Peach, he cemented a place in literary history. His stories often had an undertone of mystical and/or magical happenings surrounded by darker themes and ideas and usually involved orphaned or poor children. The BFG is one of those stories and now Disney has decided to make it into a feature length film. Sophie (Rubie Barnhill; 4 O'Clock Club) is an insomniac orphan who haunts the halls of the orphanage late at night. She loves reading and lies in bed all night devouring a good book. Though she has been warned to stay away from the window and balcony, she just can help but peek one night and sees something she can't quite believe. The BFG (Mark Rylance; Bridge of Spies) roams the streets of London late at night planting the dreams he has caught into peoples' heads. Unfortunately, once Sophie sees him he can't let her tell anyone and snatches her away to Giant Country so she can't tell on him. Ironically, he is the "runt" of his group who doesn't eat people and is often picked on by the other giants. In his quest to keep Sophie safe, he hides her away so the other giants can't find her. Unfortunately, when his plan backfires, he and Sophie must find away to enlist help so the other giants don't hurt her. Director Steven Spielberg (Schindler's List) uses sweeping visuals and first person camera angles to give us sense of the enormity of the world of these giants. The film has his signature stamp all over it and fans of Spielberg will enjoy his film style immensely. Rylance does a great job as The BFG and proves yet again why is he is an Academy award winner. Barnhill is young and has little experience, and I found her performance to be alternately good and lacking depending on the scene. I also found her voice to be a little bit annoying. It will be interesting to see how she grows and what type of actor she will possibly become. The visual effects are lackluster, to say the least, and the story is uninspiring. There are numerous holes in the plot such as Sophie and The BFG ever being able to get remotely near the queen of England and, as with all Dahl plots, one must suspend belief to enjoy the story. Unfortunately, the screenplay by Melissa Mathison (E.T. :The Extra Terestrial) is slow and monotonous. The story drags and fails to builds must momentum, even during the climatic battle scene between the giants and the British Army. Conversely, the fantasy world of the "dream tree" is magical though, and gives the movie a sense of whimsy and playfulness it desperately needs. Unfortunately, those moments are too few to make a significant difference to the overall story. For many adults the film will seem long and somewhat unnecessary. However, to children between the ages of around 5 to 10, the world of The BFG will be all the things I mentioned earlier – whimsical, fanciful, and magical with a dark undertone that is a signature of Roald Dahl's writing. It's coming in a week!!!! #flickdirect #TheBFG Matilda, despite every injustice done to her she was kind and continued doing her best, with a little magic to make it fun of coarse. I can't wait for the movie! Like if you can't wait for the movie!